Wahama head coach James Toth talks to his team during a break in the action, during the White Falcons’ loss to Southern in Week 3 in Mason, W.Va.
Last Week: Wahama lost to Eastern 42-0, in Mason; Waterford lost to Trimble 42-12, in Glouster. Last meeting between the teams: Sept. 1, 2017. Waterford won 27-0, in Mason. Current head-to-head streak: Waterford has won 3 straight. Wahama offense last week: 60 rushing yards, 52 passing yards. Waterford offense last week: 30 rushing yards, 101 passing yards. Wahama offensive leaders last week: QB Abram Pauley 3-of-8, 40 yards; RB Tanner Smith 13 carries, 16 yards; WR Tanner Smith 2 receptions, 32 yards. Waterford offensive leaders last week: QB Peyten Stephens 8-of-23, 101 yards, 1TD, 2INTs; RB Braden Bellville 11 carries, 17 yards; WR Nick Fouss 4 receptions, 52 yards. Wahama defense last week: 270 rushing yards, 147 passing yards. Waterford defense last week: 294 rushing yards, 52 passing yards. 1. The White Falcons hold a 9-4 edge in the all-time series, which began in 2002. Only one of those 13 meetings, the 2007 contest, has been decided by less than 10 points. 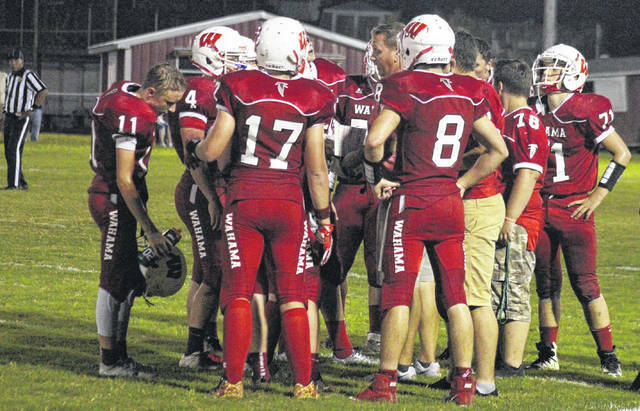 Wahama’s last trip to Waterford was on Sept. 2, 2016 and resulted in a 58-0 Wildcats win. 2. Last week’s Wildcats setback ended their 19-game Tri-Valley Conference Hocking Division winning streak. It ranks as the third-longest league winning streak since the expansion of the TVC Hocking prior to 2010. Only Trimble’s 33-game league winning streak from 2012-to-2016, and Wahama’s 24-game league winning streak from 2010-to-2013 are longer. 3. Wahama has rushed for nine of its 10 touchdowns this season. The White Falcons are 6-of-10 on two-point conversion attempts this fall. 4. The Wahama defense has allowed 25 rushing scores, five passing touchdowns, two defensive touchdowns and one on special teams. The 147 passing yards given up by the White Falcon defense last week was the most since Week 2. 5. Waterford enters Week 7 at 8th in the OHSAA Region 27 playoff rankings. Wahama remains tied for 36th with Hundred and Greenbrier West in the WVSSAC Class A rankings.